I don’t love the Canadian Tire Gas Advantage Mastercard. It has a great marketing campaign where they tell you how you can save some cents / L on gas. I just don’t think it is that rewarding. There are a few groups of people who will be able to get some good value out of this card. Unfortunately, those who would potentially get better value out of the Gas Advantage Mastercard will also likely spend a lot of effort chasing that small gain. ie. It is the cheapest in your area, most convenient for you etc. 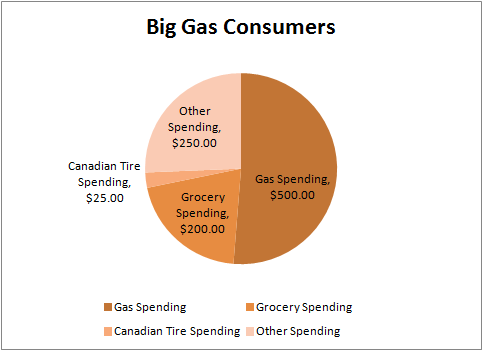 Every month, the purchases made on your Canadian Tire Gas Advantage Mastercard are counted. Your gas discount in month 2 is based on the total purchases in month 1. Each $1 in purchases at Canadian Tire stores count as $2 for the purposes of calculating the discount. Instead of getting points for each purchase, you are given a reward as a discount on your next month’s gas purchases. The discount is only valid for the first $700 in gas purchases each month. Here is the schedule for the discount offered based on the purchases made. I like to think of this as a card who rewards you with a Price Privilege card (similar to what Esso offers). The reward accumulation period is only 1 month. The expiration of the Price Privilege card is also only 1 month. Thinking of it this way allows us to compare to other programs. Most people will get better value out of the MBNA Smart Cash Mastercard or one of the Scotiabank cards (Momentum Visa Infinite of Scotia American Express Gold) that privileges gas purchases. 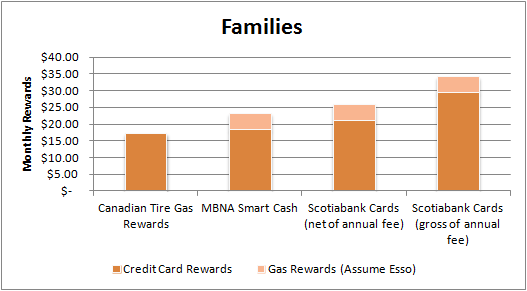 The MBNA Smart Cash is the most similar to the Gas Advantage in annual fee (none) and income / acceptance requirements, while the Scotiabank cards carry annual fees, and higher income / acceptance requirements along with the better earning rates. 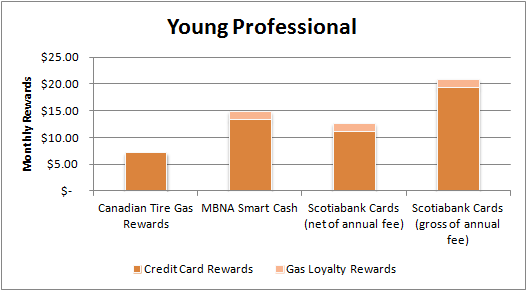 The analysis in this review will compare the Canadian Tire Gas Advantage Mastercard with the MBNA Smart Cash and Scotiabank Momentum Visa. *The point here is that putting an extra dollar of spend on the Canadian Tire Gas advantage card will not get you any benefit if it doesn’t eventually get you to another discount level. While on the other 2 cards, every dollar of spend gets points of an exact value. In previous articles, I went through the gas programs in Canada. I discussed the Esso Extra and Petro Points programs as the most rewarding gas programs. When redeemed properly, the Esso Extra and Petro Points could yield about 1.5% return on spending, or $0.01 / L discount on gas, based on 2014 (Toronto) gas prices of $1.30 – $1.40 / L.
Something to be aware of is that using this card requires that you redeem your reward for discounts only at Canadian Tire gas stations. In my area, gas prices are fairly constant across all the stations. What convinces me to go to any station is a mix of convenience, followed by the rewards program, with Esso being the most rewarding in the loyalty space. Using the Canadian Tire Gas advantage Mastercard would require me to sacrifice the Esso Extra Rewards I would have potentially got at an Esso (if I were indifferent between a Canadian Tire and an Esso) or even force me to pay more for my gas / use a less convenient gas station (if Esso was cheaper). For me, and many other people, this should reduce the discount offered by this card by at least 1cent / L (due to the loss of Esso Extra points or Petro Points). To get a sense of who this might work for, I have put together 3 sample spending profiles to see if it would make sense to use this Canadian Tire card or the other cards I have used in this analysis. In this analysis, I have assumed that the using the Canadian Tire Mastercard would result in filling gas at Canadian Tire. I assumed that in the other situations, gas would be filled up at Esso, and there would be Esso Extra points earned (shown as the additional bar in the graphics). 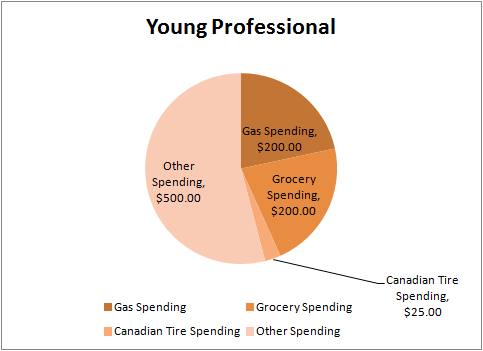 I figured young professionals might have 1 car, and probably spend more on restaurants, entertainment, travel and clothing than gas and groceries. In this situation, it appears that the Smart Cash Mastercard outperforms the Canadian Tire card by a good margin. The Scotiabank American Express Gold card would do well if there is a large share of spending at restaurants and entertainment (ignored for this analysis). 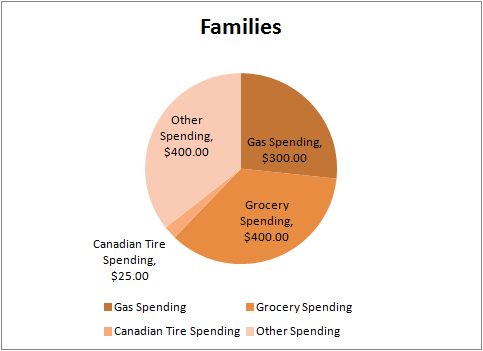 Families probably spend more on groceries and things like clothes etc, but probably a little more on gas for soccer practices and piano lessons. In my sample budget, we see that the Canadian Tire Mastercard doesn’t fare well against any option. Unless you are spending a significant amount on gas, the Canadian Tire card will not fare well. In this situation, I assume that the user spends significantly more on gas. I also assumed that the gas filled up would be the premium gas. As a result the value of the Esso rewards is higher. 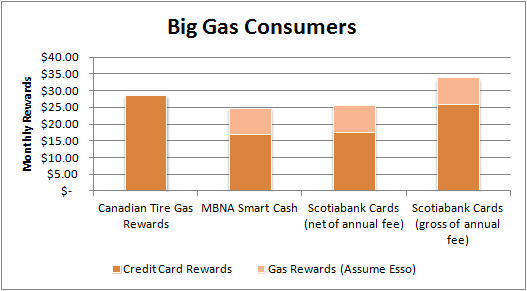 Assuming you are ignoring the gas loyalty (Esso) rewards, the Canadian Tire Gas advantage Mastercard fares very well. This is really the only group that the card works for. In an effort to extract full value from this card, I have done some analysis on how to target the discounts at each tier. In some situations, certain tiers are worth targetting and other times, it just isnt worth using this card if you are going to end up in a certain spending tier. If you are spending less than $500 / month on your card, then your reward will always be capped at a $0.02 / L discount on your Canadian Tire gas purchases. This is not a bad discount when viewed on the surface. However, when compared to other options, this is not very good. The best way to maximize value at this tier is to spend just over $500 / month at Canadian Tire gas stations and no more on this card. This would allow you to maximize your return. This tier is a tough one to figure out. Spending the 1000th dollar gets a $0.08 / L discount on your Canadian Tire gas purchases. I would restate that as “you get an additional $0.03 / L discount for spending the 1000th dollar”. The previous tier was $0.05 / L discount for spending $500, so spending an additional $500 would get an additional $0.03 / L discount. A few things of note there. While the first $500 could be put towards gas, which was being discounted, not all of the next $500 can go towards gas. There is a limit of $700 worth of gas that can achieve the discount. This means that at least $300 of your spend must be on non-discounted (by the card) items that would have otherwise earned you at least 1% from another card. o That means that the max return of your $500 spend (the $500 of spend to gdet you from $500 to $1000) is $15. You would be sacrificing at least $5 (that you could have earned with another credit card) for that $500 spent trying to chase $15. Personally, I don’t think this is a good tier to chase. Assuming you are comfortable with spending the $1000 on this card, you would be hard pressed to find value in spending an additional $1000 / Month to hit $2000. At the $2000 spend level, you would earn a $0.10 / L discount. Said differently, that is an additional $0.03 /L discount. Doing some similar math above, the biggest benefit you can get is an additional $15 for spending that additional $1000 on the card. To get that discount, you would need to be buying 500 L ($700) in gas in a month. If you are spending less than $450 / month, this is going to not be good value for you. This card can have some good value if you spend between $450 and $700 in gas (at $1.35 / L) every month and you prefer to use Canadian Tire gas stations for your gas. If you are not spending the $450 in gas or you are happy to fill up at Esso, then this card is unlikely to consistently derive the best value for you. can I get my account balance in the computer rather than receiving paper ? Yes you can. Just call up Canadian Tire Mastercard and htey would be happy to do it fo ryou. Don't subscribe All Replies to my comments Notify me of followup comments via e-mail. You can also <a href='https://www.creditwalk.ca/comment-subscriptions/?srp=3251&srk=2648578ecea05c83754707575dc5a494&sra=s&srsrc=f'>subscribe</a> without commenting.